It was Aldous Huxley who said, “A man [or woman] may be a pessimistic determinist before lunch and an optimistic believer in the will’s freedom after it.” A testament to the transformative power of the midday meal. However, as we know, not all corporate lunches are created equal. How many times have you sat, meeting after meeting, staring down a plate of curled up sandwiches? Picking at a lackluster salad in the hope of finding a few crisp morsels to abate your hunger. Enough, already. 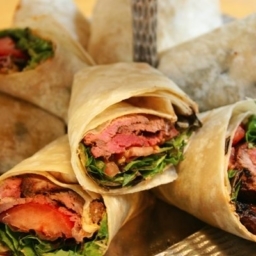 Here are ten organic, healthy lunch ideas to revolutionize your corporate catering. Before we dig in, let’s consider for a moment why we should bother to ensure that lunch at work tastes and looks as good as any meal you’d order from a restaurant. Surely, all we’re after is raw fuel, right? Certainly, in terms of depleting your energy reserves, eating lunch is the only way to sidestep the afternoon slump, unless, of course, that lunch is heavy on the carbs. Instead of skipping back to your desk feeling buoyant and recharged (ok, maybe that’s a stretch), you’re more likely to feel bloated, sleepy and less inspired than ever to crank through that to-do list. Let’s look at it from another angle. If you’re a parent you’ll be familiar with the hours we spend agonizing over what to feed our kids for lunch. Yet why is it that we just can’t seem to justify applying the same rules to healthy lunch ideas for adults? So what happens when lunch gets exciting, healthy and creative? Suddenly everyone becomes a whole lot more engaged. People actually want to eat it, for a start. They feel nourished, not stuffed, and are energized throughout the afternoon. Sure enough, they begin to anticipate the next day’s menu. They make plans to meet friends over lunch. Teams bond, ideas are shared around a table, and there’s a buzz where there was once a vacuum. 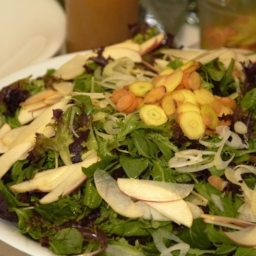 Many people assume that organic catering means costly catering services. Not so. 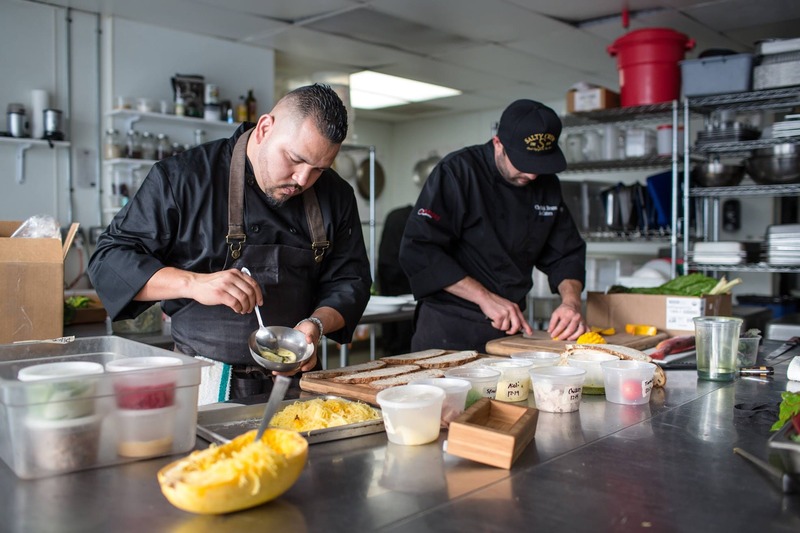 When you work with smart organic corporate caterers with excellent relationships with local suppliers, you know that every dish is made using Mother Nature’s very best ingredients, which means they’re packed with flavor. They really only need the lightest touch to shine. Minimal salt, no unnecessary frills. In short, you get more bang for your buck. 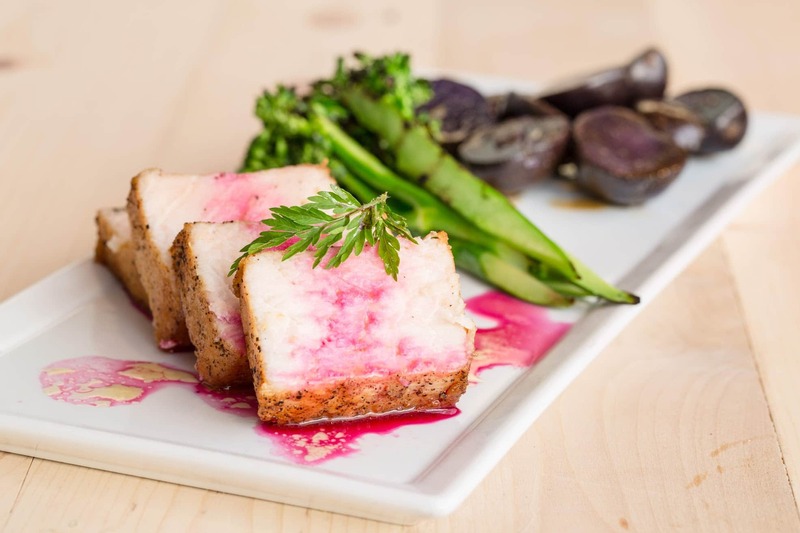 A really good corporate catering company will also have perfected the right portion size to satisfy even the hungriest employee while minimizing waste. So make sure you choose from caterers that have a good reputation in a corporate setting. That means your hard earned dollar is never thrown out with leftover food. 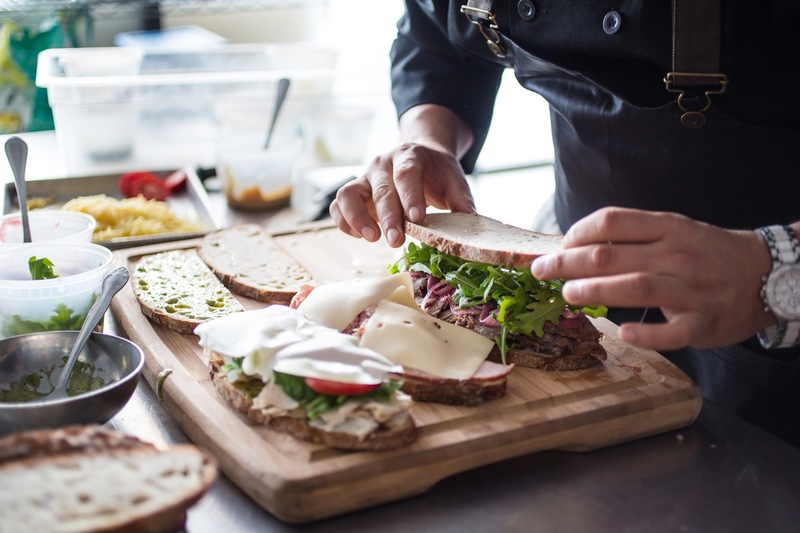 In fact, showing you care by giving your people a delicious, organic lunch daily is one of the most affordable ways to attract and retain talent and rocket afternoon productivity. This light meat-free noodle dish is guaranteed to tantalize your taste buds and put a spring in your step to help power you through the afternoon. Hot, aromatic and uplifting this vegetarian and vegan pad thai is lovingly made using the best local, organic ingredients to deliver a depth of flavor with a refreshing zing of fresh herbs. Brighten up your lunchtime catering menu with this symphony of flavors and textures from melt-in-the-mouth buttery chicken, savory herbs, and crunchy roasted cauliflower. Farro and zucchini provide the counterbalance to the sing-song brightness of the chicken to result in a satisfying dish that won’t weigh you down. Low-carb, gluten-free and vegan, this jackfruit burrito is the perfect guilt-free lunch, not least because it’s light but filling enough to sustain you for the rest of the working day. A little citrus twist gives balance to the earthiness of the beans and transforms the humble burrito into a work of art. Sometimes only comfort food will do on your corporate catering menu. If you’re in need of a little lunchtime love then this medley of golden beets, deep green broccoli, and fire red peppers will put a smile on your face and a spring in your step. Chefs are suckers for a simple dish that pays tribute to truly great ingredients. 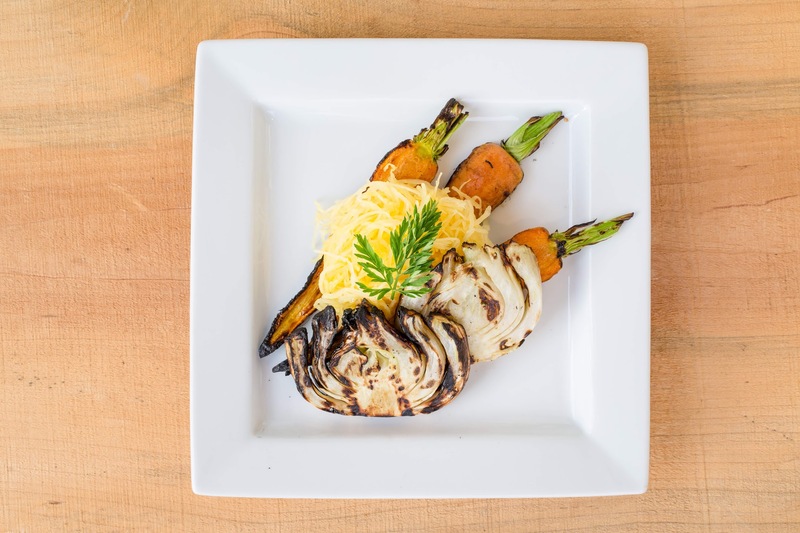 Don’t be deceived by the short list of ingredients in this wholesome summery meal, it punches far above its weight and delivers tenfold with big, bold flavors guaranteed to win over your staff. Think of the low-fat protein as the canvas, and the splashes of color as zesty notes of ginger, a kick of chili, and aromatic herbs. It’s the ideal pick-me-up after a heavy morning–light, energizing and easy to digest, but substantial enough to spur you on through the afternoon. Veggie-packed and delicious, this noodle salad is positively saintly (don’t worry, sinners, you can dig in too). It’s a crunchy rainbow of a dish that will delight your taste buds and keep sensitive tums happy. Pork and apples are a match made in heaven, but why save it for Sunday? Pair them with immunity-boosting, paleo-friendly yams for your midday meal and you’ve got a classic comfort dish with hidden superpowers. Who doesn’t love a sumptuous vitamin-packed tomato soup? Fragrant and wholesome (nostalgic, even? ), this soup has the power to bring you back to yourself when your mind has been spinning all morning. A crunchy fresh farmers market salad provides added bite and together, they’ll send you on your way feeling renewed. Bursting with Middle Eastern flavors (and aromas), this chicken shawarma is one of the best lunch ideas for work, not least because it’s light but delivers on taste. Served with earthy hummus, cooling yogurt and the sharpness of pickled onion, this dish is like a ticket too far-flung places…and then back to the office again. 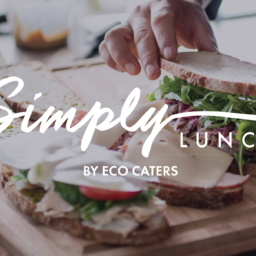 Want to find out more about Simply Lunch? Drop us a line to set up a free, no-obligation consultation. Word wrangler and lover of good food, Zoe specializes in writing for the travel and hospitality sectors. Her love affair with beautiful, simple ingredients blossomed after hours spent tending her Italian grandfather's vast vegetable garden. She believes in the transformative power of travel and food, preferably at the same time. Favorite travel food moment? Blinking in the morning sunlight on a rooftop in Rome, eating the most fragrant ripe peach and sipping a seriously muscular espresso as the city stirred below.